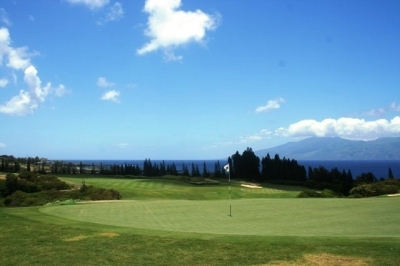 KAPALUA, MAUI, HI – “Bill, it rises gently from the sea,” remembered Bill Coore, in thinking back to how partner Ben Crenshaw described the nature of the land on a potential new golf course venture at Kapalua on the west side of Maui in the late 80’s. Seeing as two-time Masters Champion and ’99 Ryder Cup Captain Crenshaw wasn’t known for hyperbole in discussing golf course properties, Coore took his partner at his word in assessing the land’s ultimate potential – and what resulted a few years later was the Plantation Course at Kapalua, a golf course many of us are intimately familiar with, having seen it every year on TV as the host of the PGA Tour’s annual opening tournament, the Mercedes-Benz Championship. One of golf's greatest feelings - standing on the tee of the Plantation Course's 1st hole with a downhill shot and the wind at your back. 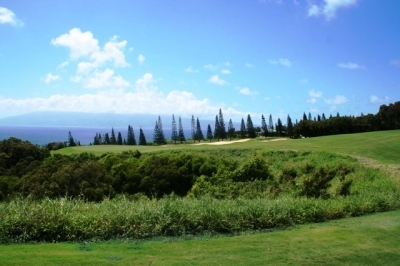 Crenshaw had been playing in the old Kapalua Invitational at the time (again, the late 80’s), and was approached by TV commentator and Hawaii resident Mark Rolfing for his thoughts on a large plot of land and its prospects for building a championship-level golf course that could one day host a regular PGA Tour event. 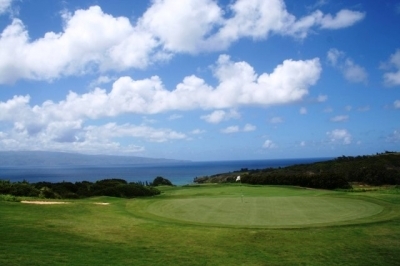 Coore said Rolfing (who was a partner at Kapalua’s developer, Maui Land and Pineapple Co.) and Crenshaw essentially checked out the much flatter lower portions of the property, and hence, Crenshaw’s initial assessment of the ‘gentle’ slope of the land. “We still kid Ben about it to this day,” Coore added. 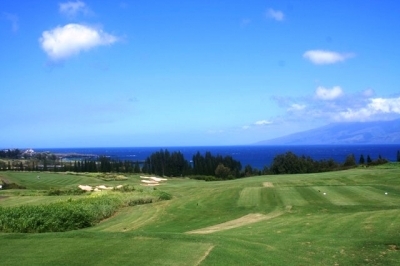 Because upon further investigation, the design team discovered that the Kapalua pineapple fields, rugged natural areas and ravines that would eventually shape the course were anything but ‘gentle’ – quite to the contrary, in fact. At least Crenshaw got the ‘slopes from the sea’ part right. Here's a rare view at the Plantation Course - the perfectly flat par three 2nd hole. Despite Crenshaw’s initial miscalculation as to the property’s topsy-turvy topography, both men agreed that the eventual final product was worth all the effort it took to find a workable way to place a golf course on one of the world’s most beautiful pieces of earth – with scenery so stunning that adding golf to it could only serve to mix two of life’s true pleasures, viewing nature’s awesome beauty and playing the grand and ancient game of golf. 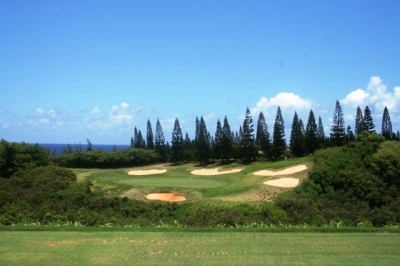 Coore said the team realized soon after starting that building a golf course at Kapalua would be no easy undertaking. 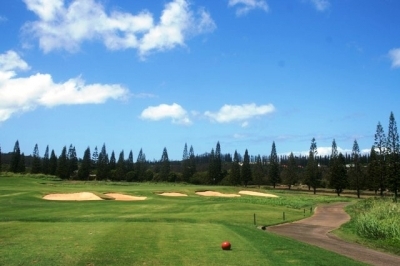 In addition to the difficulty of routing a layout on some narrow slivers of land heading up and down the mountainside, they could only build three or four holes at a time due to Hawaii’s environmental permitting process. “We’d put irrigation in, grass them, and then move on, to keep the erosion possibilities down. So even though it was in Hawaii where the weather cooperates year-round, it took two years to build the Plantation Course,” Coore explained. Looking back from the green of the par five 5th hole. Going slightly uphill and often against the wind, it plays longer than its 532-yards would suggest. And yet they wanted a very traditional golf course on a very non-traditional piece of property. The solution? Build to scale. Everything at the Plantation Course is big as a result. You’ve heard the TV announcers talk about it – 100-yard wide fairways in some spots, humungous bunkers, gigantic greens and of course, big-time scenery. Crenshaw and Coore are both from Texas, but this particular parcel of Pacific Hawaiian island is a long way from the Lone Star State. It hardly matters – this ‘big’ golf course could snuggle up nicely to any of the grandest features in Texas. The par three 8th hole looks benign, but miss the green and you're probably in trouble. Wind and slope – two factors that can’t be ignored on the Plantation course, and in case you temporarily forget, there’s always the next shot to remind you. You get the impression that a ‘regular’ golf course on this site just wouldn’t work, and that was the impression Crenshaw and Coore took away as well. Coore reminded me that the pros weren’t the only ones to take into consideration. Though the course was certainly designed with attracting a professional tournament in mind, it also had to cater to tourists and recreational players the rest of the year. From personal experience, the big surfaces add the necessary element of confidence even when the wind’s blowing ‘moderately’ (in the words of the Plantation’s Head Professional, Scott Carroll) at 30 mph, as it was the day we played. One of the most beautiful holes in Hawaii, the par five 9th at Kapalua's Plantation Course - it's also one of the hardest you'll ever play. By the same token, just because the playing surfaces are exceedingly large, it doesn’t mean you can just bang away out there and still post a great score. Like all thoughtfully designed golf courses, the Plantation course requires you to pick a line, challenge the hazards and make some shots in order to score well. Looking towards Honolua Bay from the par three 11th tee - it looks like you're firing right into the Pacific Ocean. True, the most direct lines often bring trouble into the equation, but there are always ample bailout opportunities – and if you play from the correct set of tees, the margins for error are really quite wide. The Plantation course could easily be the ‘easiest’ tough course in the world if you play it correctly from tee to green. The walk in the park ends when you reach the greens, however. As mentioned above, the greens are exceedingly large, but they’re also sloped and grassed with Bermuda, which mandates attention to the grain. 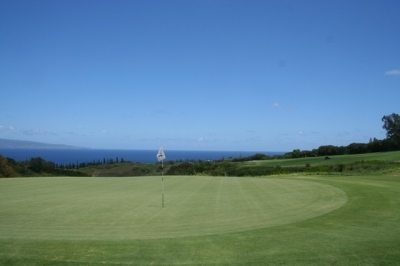 All the putting challenges are there at Kapalua: long putts, grain, big slopes, wind and pressure to avoid three-putts. It’s unfortunate that you can’t bring along a putting master like Ben Crenshaw to strike your putts for you. It’s obvious from talking with Coore that he and Crenshaw take pride in their work on the Plantation course, but the Kapalua folks are just as satisfied. The relationship is a continuing one, as Coore and Crenshaw still visit regularly to look after things and suggest improvements. It’s the type of ongoing, personal care that the developers wanted in the first place. Playing 305-yards, uphill and into the wind, the pros still sometimes try for the green from the tee on the 14th hole - for the rest of us, it's a challenging short par four. The par five 15th hole is a good example of the Plantation Course's playability and challenge - it's a relatively easy par but you'll need to earn a birdie. The Plantation course is one of those layouts with eighteen ‘signature’ holes, but favorites included the famous par four first hole (the one you see quite a lot on the Golf Channel). The pros play it at 520 yards, but it’s downhill and with the prevailing wind, as Jones described above. The regular tees cut the distance to 434 yards, which makes it a drive and a mid-iron for most folks. The second shot on the par four 17th hole is pure intimidation - you can try and fly it to the green, or bail to the right. 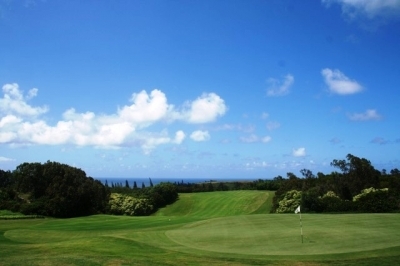 The par three eleventh is another charming one-shotter that plays towards Honolua Bay – breathtaking views and quite a challenge to choose the right club to hit this relatively small target. Head Pro Scott Carroll told us that this is one hole he never seems to get right, because the wind conditions make club selection so difficult. Playing the Plantation course is an experience that shouldn’t be missed if you’re heading to Hawaii. Not only is it fun to walk in the shoes of the pros who hit the same shots every January, it’s an architectural masterpiece that’s worth a look in and of itself. Standing on the tee of the par five 18th hole, you get a sense of history as you walk in the footsteps of the greatest players of the game. And once they tell their friends, just maybe they’ll describe it in a way their friends will never forget… just as Ben Crenshaw did to Bill Coore, all those years ago. 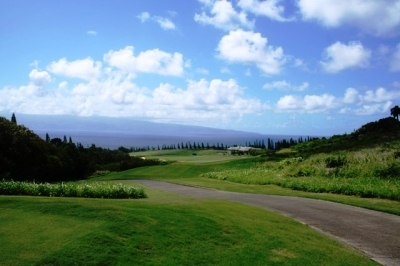 Check the Kapalua website for current rates. 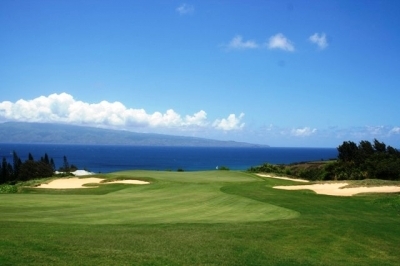 Kapalua does offer some great “stay and play” packages, including new “Unlimited Golf” – Check the Website. Click here for information on packages.